Digital technology has transformed the way people communicate, get news, shop and even find love. And as more tasks migrate online, there are unique barriers and challenges that may hinder some older Americans from going online and using new technology. But despite these challenges, many seniors have a positive outlook about technology and the benefits it can provide. 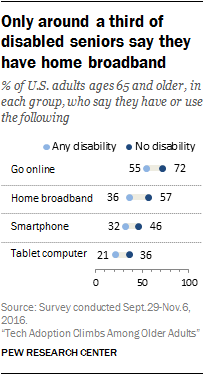 And once online, many older adults engage deeply with online content and activities. One challenge facing older adults with respect to technology is the fact that many are simply not confident in their own ability to learn about and properly use electronic devices. For example, just 26% of internet users ages 65 and over say they feel very confident when using computers, smartphones or other electronic devices to do the things they need to do online, according to a 2015 Pew Research Center survey. Roughly one-third describe themselves as only a little (23%) or not at all (11%) confident in their ability to use electronic devices to do necessary online activities. 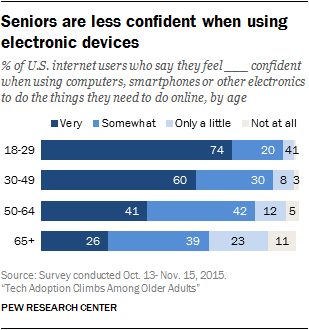 Hand in hand with this lack of confidence in their own ability to use digital technology, seniors are also more likely than those in other age groups to say they need others to show them how to use new devices. 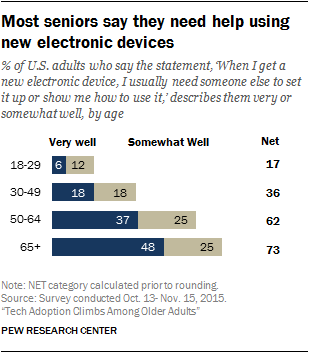 Around three-quarters of Americans ages 65 and up say the statement, “When I get a new electronic device, I usually need someone else to set it up or show me how to use it,” describes them either very (48%) or somewhat (25%) well. Once online, most seniors make the internet a standard part of their daily routine. 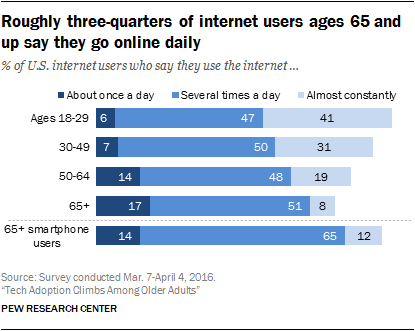 Roughly three-quarters of older internet users go online at least daily, including 17% who say they go online about once a day, 51% who indicate they do so several times a day and 8% who say they use the internet almost constantly. Among older adults who own smartphones, this figure is even higher: 76% of these smartphone-owning older adults use the internet several times a day or more. Similarly, a relatively small share of older adults use social media – but those who use these platforms tend to be highly active and engaged. For instance, fully 70% of older adults who use Facebook indicate that they log in to the service on a daily basis. Other Pew Research Center surveys have found that older adults who say they get news on social media engage with news on these platforms at similar rates as social media news consumers who are ages 18 to 29. And even though playing video games is much more common among younger adults, many seniors are taking part in this tech-based activity. One-in-four adults ages 65 or older say they play online video games, according to a Pew Research Center survey conducted in 2015. Despite these concerns and challenges, there are a number of areas in which seniors hold relatively positive views of technology and technology-related topics. For instance, at a broad level, 58% of seniors feel that technology has had a mostly positive effect on society, while just 4% feel that impact has been mostly negative. Seniors also place a high value on the importance of home broadband service, according to a survey conducted by the Center in 2017. The vast majority of adults ages 65 and older say they believe having access to high-speed internet at home is either essential (42%) or important (49%). This puts older Americans on par with Americans of other ages when it comes to the importance of home broadband service.